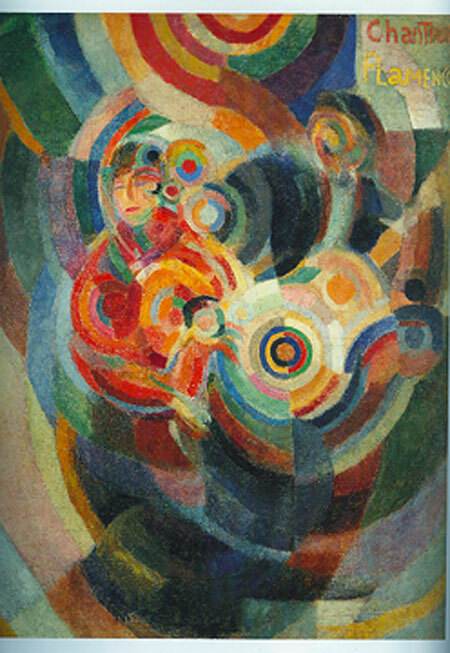 Philomene (1907) by Sonia Delaunay from Robert and Sonia Delaunay: The triumph of Colour by Hajo Duchting 1994. The artist Sonia Delaunay (nee Terk) was born in Ukraine in 1885 and moved to Paris in 1905. The young artist encountered two painters who exerted an important influence on her work: Gauguin and van Gogh. She met and married painter Robert Delaunay in 1910. Both were influenced by the Neo-Impressionists whose intuitive, spontaneous method of painting they admired as well as their systematic placement of color, and their early work could be categorized as Fauvism, work characterized by bold , saturated colors. They were an important couple during this volatile period in the arts (rise of cubism, jazz, dada, etc. ), and were friends with Paul Klee, Franz Marc, August Macke, as well as Guillaume Appollinaire and Blaise Cendrars. All were interested in the harmonies and relationships between art, music and literature. Together the Delaunays formulated a theory of color called Orphism: the animation arising from the play of simultaneous color contrasts within a work of art. 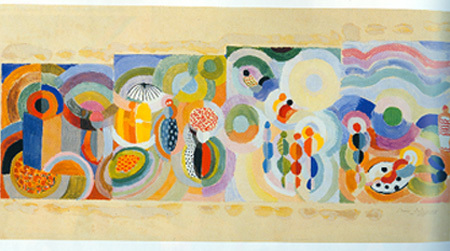 I find the work of Sonia Delaunay energizing and passionate, earthy and joyous. This scene, “Summer “(designed for” The Four Seasons”) always reminds me of Paul Klee’s wonderful beach scenes. But here it is more peopled, more human and more lively. (By the way, S.D. is sometimes credited with having invented the polka dot!) 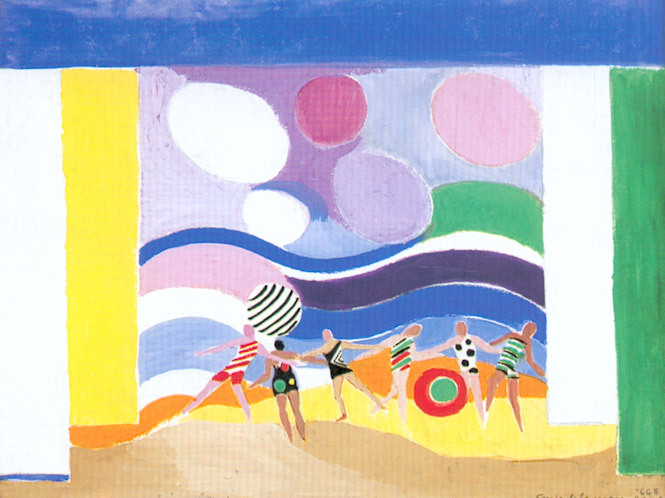 The stripes and dots of the bathing suits repeated in the beach balls and the sky and clouds set a scene that would be lighter than air if not held down by the sand dunes and the broad stripes of paint white, yellow, green and blue that almost suggest a stage set. Flamenco Singer (1916) from Robert and Sonia Delaunay: The triumph of Colour by Hajo Duchting 1994. Long Journeys (1937) from Robert and Sonia Delaunay: The Triumph of Colour by Hajo Duchting 1994. This is a gouache study for a mural that Delaunay painted with many assistants and was installed at the Palais des Chemins de Fer (The Train Palace) at the 1937 World Exposition in Paris. (It’s approx. 245 meters!). 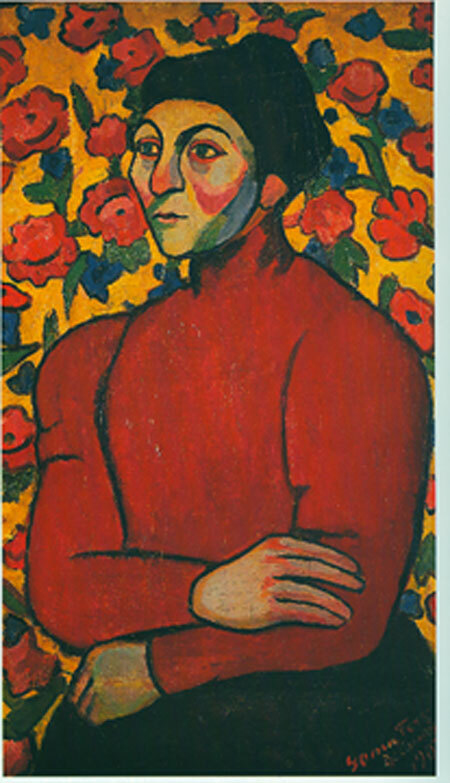 Sonia Delaunay continued to work until a very advanced age. In her later years she did many tapestries (executed by Olivier in Aubuisson and exhibited at Modern Art Museums, as well as designing fabrics, scarves, tableware and tablecloths. She was given the Grand Prize of the City of Paris and became a member of the Legion of Honor in 1975. She died in 1979. Note: I got both my paraphrased and quoted material from Robert and Sonia Delaunay: The triumph of Colour by Hajo Duchting 1994. Adoro as obras de arte de Robert Delaunay e também gosto muito da Sónia Delaunay!!!! I have the following original painting signed by the artist. Do you know the value of the painting? The sites you found are terrific, esp. the textile designers of the 20’s and 30’s. But take another look. I saw at least 4 of S.D.”s designs! I think you can see the influence of both Gauguin and van Gogh in the Philomene portrait. (Actually I see Matisse in it too, although both she and Robert claimed not to like Matisse’s work because there wasn’t enough color in it!) The heavy paint, the black outlines and the green’s in the flesh tones really seem van Goghish. But who was quite young (22) when she painted that, and by the time of the Flamenco Singer (9 years later) she has her own definite style. Much of her later work was quite abstract. And she did many series of the same geometric shapes done in different, very saturated colors — her “simultaneous” work. But she did textile work, and book work, and paper work (collage), all along. I don’t think it was dummied down. But I do know that her scarves are still for sale at the Art Institute, and they’re wonderful. In 1925 she designed dresses and painted a car to go with them for the photograph. She did costumes and set design for a movie in 1926. Both the Delaunays wanted to integrate their theories of art into every discipline they could. One year they desinged a range of lamps and strip lights. Visual rhythm and color were their forte, and the medium was anything they (but mostly she) could get their hands on. Here’s a great site for looking at fabrics from the upscale designers of the 20’s and 30’s. There’s only one of Delaunay’s designs there, but you can see that she’s working very much like other designers of the period. And here’s an article that compares Delaunay’s radical notions of making fabric specifically for the shape of the garment (rather than shaping a garment from already printed fabric) and the connection between that and contemporary computer design-garment possibilities. I skipped most of the computer stuff, but found the Delaunay information very interesting. She, like current textile artists, seemed to move easily between flat wall hanging stuff (ie paintings) and textiles. Thanks, Clairan, for taking me on this trip this evening. I was interested in your comment that Delaunay was influenced by Van Gogh and Gauguin. Because she switches to textiles and what we would call interior decoration or domestic textiles, do you know if the Van Gogh/Gauguin influence carried over — and how — that is, which parts. And the idea of “contrasts” (as well as that portrait) seems antithetical to my notion of “proper” interior dec — where soothing with a bit of accented color is often the norm. Even the use of painted interiors tends to run toward the grayed colors, not the primaries. Or at least I think….. (I don’t keep up on trends in color and interior dec as I should). By the way, one way I learned a whole lot on the old Ragged Cloth was by googling the artists mentioned about whom I knew nothing. That brought me up to speed very quickly. So if, Zelda, you like Delaunay, you might want to google Orphism and Robert Delaunay and fauvism. Even Wikipedia articles give you insights into areas you may not have known existed. I would like to know more about Delaunay’s textile work, how it came out of her paintings and whether it was dummied down to make it commercially viable or what. Guess I’d better go google…. The four examples are an interesting progression through time and styles. They all have rather saturated colors, and depict women. The first one is very expressionistic, the second (beach scene) looks like the Roaring 20s and Deco and women daring to bob their hair and show their legs (perhaps that is why they are in a “theater”? ), then abstraction comes in. I imaging the Singer to be about jazz, not folk or church hymns! The latter three pieces all make good use of stripes and curves, which makes me think the early portrait was before she had developed her own kind of style. i have just found this blog and i am very interested in your thoughts, i will give myself a little time to read around before commenting. thank you for the forum. Thanks, Sandy, I’m glad you enjoyed it. Zelda, please don’t feel intimidated, but simply respond. That’s certainly one of the things we’re all doing here! Even if I had read Terry Barrett’s books, I don’t think I could respond to your question without first reading the book about the Delaunays. However, I can say I like her style and color usage very much, and thank you. I was unaware of her prior to this.